Sarasota is a city located in Sarasota County on the southwestern coast of the U.S. state of Florida. It is south of the Tampa Bay Area and north of Fort Myers. Its current official limits include Sarasota Bay and several barrier islands between the bay and the Gulf of Mexico. Sarasota has a host of urban amenities and the kind of small-town feel that will have you falling in love with the area the moment you arrive. Walkability around town and the variety of businesses available make the area easy to enjoy. The clean air, sparkling white sand beaches and sunny climate have made Sarasota world famous as a center for the good life. In fact, Forbes has named Sarasota one of the best places for business and careers, and Money magazine recognized it as the nation's best small city, one of the best places to retire, and one of the cities with the best health care systems. Additionally, Sarasota's vibrant recreational and cultural scene offers activities for every taste and budget. It is a diverse area with big city amenities and small town ease of living. Business owners and employees enjoy not only the good life but also a thriving business climate. The top-rated schools and motivated workforce also contribute to why Sarasota is home to some of the most successful and productive companies in the country. The above information can be found at The Greater Sarasota Chamber of Commerce website and at The City of Sarasota website, see link below. 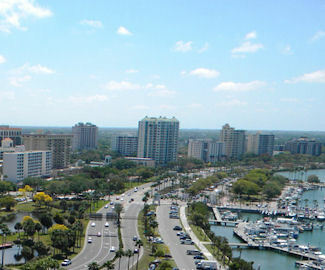 According to the U.S. Census Bureau, Sarasota had a population of 52,488 in 2007. In 1986 it became designated as a certified local government. Sarasota is a principal city of the Bradenton-Sarasota-Venice, Florida Metropolitan Statistical Area, and is the seat of Sarasota County. As of the census of 2000, there were 52,715 people, 23,427 households, and 12,064 families residing in the city. The population density was 3,539.8 per square mile. There were 26,898 housing units at an average density of 1,806.2 per square mile. The per capita income for residents of the city was $23,197. The median income for a household in the city was $34,077 and the median income for a family was $40,398. From 2005-2007 the per capita income for the county was $28,326. The median income of households in Sarasota County was $49,030. Information from Wikipedia. This is a community with an abundance of outdoor activities both on the water and on land. Residents and visitors enjoy fishing, sailing, swimming, kayaking, and boating, and the indoor activities range from museums and galleries, to shows and the opera. Following a day of shopping or taking advantage of Sarasota's many activities, stop by one of the many fine and diverse eateries for dinner and cocktails with friends or family. The Sarasota Farmers Market, located at Main & Lemon in Downtown Sarasota, was established in 1979. The Market continues its tradition of serving the community with local produce, plants, prepared foods and artisans. The Market is open every Saturday 7am to 1pm (Rain or Shine) and currently has 70+ vendors and covers 5,000 sq. ft. of produce and plants. Bobby Jones Golf Club is a 45 hole municipal facility named for the legendary Robert Tyre Jones, Jr., who personally dedicated the facility on Sunday, February 13, 1927. The course offers a Practice Range, Chipping and Putting Greens, a Golf Shop, Tennis Courts, Tournaments and Leagues, and Mulligan's Grille, a full service 150 seat facility offering breakfast, lunch, dinner and full bar service. Sarasota Jungle Gardens is the area’s only ZOOlogical Gardens. It features 10 acres of lush tropical vegetation, winding jungle trails and entertaining, educational bird and reptile shows throughout the day. The Sarasota Convention & Visitors Bureau (the SCVB) is the official and primary provider of visitor information for Sarasota County where tourism is the top industry. SCVB operates the official Sarasota Visitors Information Center located at 701 North Tamiami Trail, south of the Sarasota Bradenton International Airport. The Herald-Tribune Media Group publishes The Herald Tribune, the Sarasota local newspaper, as well as seven special magazines that reflect the Sarasota way of life, these are: Style; Dining Plus; Golf & Leisure; the annual publications Gulf Coast Welcome, Hurricane Guide and Physician Guide; and Your Sarasota. For additional links to great places to see in Sarasota visit The City of Sarasota website. Villa Grande at Sarasota retirement community offers 1 and 2 bedroom apartment homes with an emergency call system, walk-in closets, fully equipped gourmet kitchens, washers and dryers, ceiling fans, and access to a private screened lanai from both the living room and the master bedroom. Equipped with elevators and accessed by interior hallways, residents can select their home from four spacious floor plans, each of which features high-end finishes and upgrades like those found in custom homes. Amenities include a Cyber Cafe', an Arts & Crafts room, a beautiful heated pool and fitness center including your own personal trainer! Villa Grande at Sarasota is just minutes away from the beaches and all the exceptional cultural, recreational, dining and entertainment venues and its convenient location provides ready access to grocery shopping, health care services, doctor’s offices, St Armand’s circle, and many local retail shops. 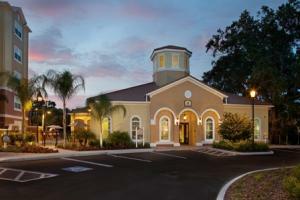 With quick access to Interstate 75, traveling around Sarasota is easy. 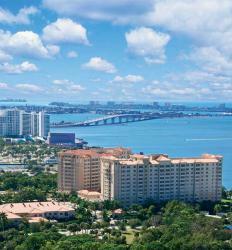 Sarasota Bay Club provides luxury retirement living carefully created to offer the very best of everything. Residents will enjoy first-class amenities and services, including award-winning dining, all set in an exclusive resort-style campus overlooking Sarasota Bay and Longboat Key. Sarasota Bay Club offers exquisite condominium residences with a wide selection of floor plan designs, each with its own gorgeous view; because it is structured as a condominium purchase, buyers benefit from full ownership of their home. Healthcare and lifestyle choices include Retirement Services, Rental Communities, Life Care, Assisted Living, Nursing and Rehab Services. This impressive residential enclave delivers on the highest of expectations, with stunning waterfront surroundings and beautiful Mediterranean architecture, Sarasota Bay Club is the place for your customized retirement lifestyle. Glenridge Life Fulfilling Community rises magnificently against the Sarasota sky on the beautiful west coast of Florida in a pristine 90-acre setting. Independent living features single-family Club Homes and low-rise Residences, with floor plans up to 2,488 square feet – designed in the Addison Mizner tradition. 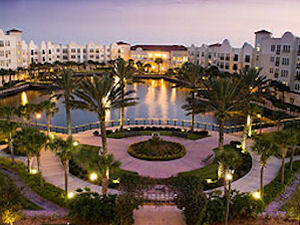 Amenities include outdoor recreation pavilions, personal gardening areas, lakes and fountains, a spectacular 60,000 sq. ft. Village Commons, a Performing Arts Center, a state-of-the-art Fitness Center & Spa, 2 Har-Tru tennis courts, multiple dining venues, housekeeping and linen services, chauffeured transportation and membership opportunity with the prestigious Tournament Players Club at Prestancia (TPC), a 36-hole private golf club. Glenridge focuses on lifelong learning & optimum health for our members coupled with the security of long-term care & rehabilitation services provided through our exclusive Health Assurance Guarantee. Community members have access if ever needed to: The Carroll Center, which provides private, Medicare-approved skilled nursing and rehabilitation services. The Highlands, an assisted living neighborhood blending life fulfilling services and healthcare support. Rehabilitation Services with physical, occupational and speech therapies. Memory Support Services, specifically designed for those with Alzheimer’s disease and related cognitive disorders.